Upload speed – fast upload speeds are essential for making effective use of cloud-based technologies and for economic development; they allow users to be creators of content, not just consumers. Reliability – some technologies are noticeably affected by weather, topography and trees while legacy twisted-pair copper loops still in the ground today typically are near or at their expected life span and will limit future service upgrades no matter what electronics are installed. Expense – Some services are more expensive and can be unaffordable as a primary connection for many families. Price per GB varies widely by technology with high-capacity wired networks offering extremely low costs for both bandwidth and use, especially compared to satellite and cellular services. Latency – Effective use of interactive applications, such as Skype, require low latency (delay) making satellite a poor option for many users. 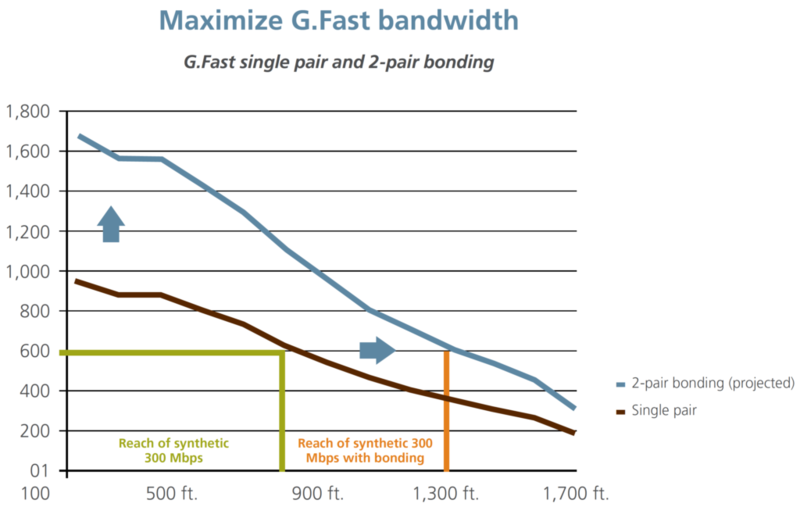 The chart below illustrates the possible speeds that can be delivered over fiber-fed copper using G.fast. G.fast performance single and bonded. Vectoring is another technology that can improve DSL speeds over copper, particularly for those closer than 3,000 feet from the DSL cabinet. This online FAQ is an excellent tutorial on different capabilities and issues with DSL technology. It is also possible to improve DSL speeds using pair bonding, a proven technology. By using two sets of copper wires, broadband capacity can be doubled. Pair bonding is reliant on the availability of copper pairs in a given location. That may or may not be available in every electronics cabinet; bonding is only possible where pairs are available. Copper line quality is an important determinant of broadband capacity as well. Older weathered copper will not be as fast as newer, well maintained copper. ix – Email correspondence between Bill Coleman, Community Technology Advisors, and Andrew Schriner, Director of Government Affairs, CenturyLink, dated January 9-10, 2018.